Fourth grade has long been considered a critical point in elementary school. It is in fourth grade that students are expected to take the big leap toward becoming more independent learners. While some students are ready for leaps, others may continue to need additional steady support. A school environment with a one size fits all approach may stand in the way of your child’s social and academic development. At Ivy League, our perfect size classes (with no more than 16 students) and commitment to personalizing education ensures that no child will get lost during this important transitional year. We use strategies, such as open task assignments – multiple ways for demonstrating knowledge, such as reports or projects which encourage children to take chances and become more independent thinkers. Also, the formal teaching of study and organizational skills in this grade, help students learn to take more control of their learning, while a spiraling curriculum ensures that students are well prepared for what lies ahead. The primary focus of our fourth grade reading program is the development of levels of comprehension - literal, inferential and evaluative. Students study the structural elements of poems, prose and dramas, and learn to summarize text in a concise manner. There is more focus on reading informational text. Within this wide range of genres, students express their understanding through discussion, reading response assignments, literature circles and direct questioning. Over the course of the year, students deepen their understanding of plot, theme, character and setting and learn to appreciate poetic devices. Vocabulary studies emphasize word analysis skills, learning to decode new words and using roots, affixes and word derivations. Fourth graders at Ivy League write for many purposes. Continuity in the writing program is reflected in the processes used in Writer’s Workshop (prewriting, drafting, revising and editing). Students learn to write short research reports by drawing evidence from informational texts including online resources. They practice taking notes and learn to quote and paraphrase information. Students also sit with teachers, where they are able to conference about content first and the purpose of the piece. At other times, newly learned rules of punctuation and English grammar usage make up the substance of class lessons. Each student keeps a portfolio of finished pieces and works in progress. Students also learn skills of presenting orally including using clear diction, volume and phrasing to emphasize particular points. The Mathematics curriculum in fourth grade is pivotal. Concepts introduced provide a foundation for the later study of algebra and engaging in mathematical reasoning. So that students receive a thorough grounding, Ivy League can adjust our schedule to accommodate the different rates of learning using an effective, balanced, instructional mathematics program. Traditional teaching and new ideas are used to develop students’ conceptual understandings, computational skills, and become more adept at solving multi-step problems. Students read, write, and compare numbers based on the meaning of digits in each place and use their understanding of place value to round multi-digit whole numbers. Well covered in fourth grade is conceptual work with fractions as students recognize and generate equivalent fractions with different numerators and denominators. Using decimal notation for fractions with denominators of 10 or 100 and decimal functions is another important strand within the fourth grade program. Students work for “automaticity” by committing their math facts to memory. The study of simple geometric measurement and interpreting data round out the grade 4 mathematics program. Ivy League’s fourth grade social studies program transcends the limits of time and place as field trips and digital learning become the gateway to past and present and to making global connections. Our curriculum centers on an in-depth study of New York State and the significant role it plays in our country’s history and economic development. Beginning with the study of Native Americans, the program traces New York history through life in colonial times, the American Revolution and the formation of our government and demographic, social and economic changes that occurred over time. Students finish the year with a study of government and its functions, examining a range of topics and develop more sophisticated thinking skills. Students utilize chronological and geographic reasoning by inferring from evidence and artifacts and interpreting the rights and responsibilities of citizenship that are embedded in the curriculum. 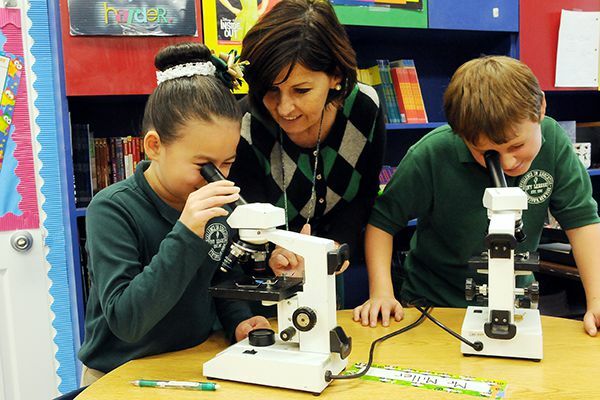 Recognizing the many advancements in science and the contributions of scientific discoveries which occur on an almost daily basis, a certified science teacher provides instruction in both the content and process of fourth grade science. A balanced comprehensive approach includes the teaching of investigation and experimentation and the explicit teaching of content and concepts. Ivy League’s curriculum is drawn from the Smithsonian Science and Technology Concepts™ program and Pearson’s Interactive Science. Technology resources provide a vital tool for developing scientific understandings and are fundamental resources for instruction. The grade four curriculum units cover physical science, life sciences and earth science. Electricity and magnetism, properties of rocks and minerals, waves, wind, water and ice, and ecosystems are specific topics which students enjoy learning about.